The Forge Bar & Gourmet Grill - Sadler Gate, Derby. Secretly tucked away in a hidden courtyard just off Sadler Gate lies The Forge. 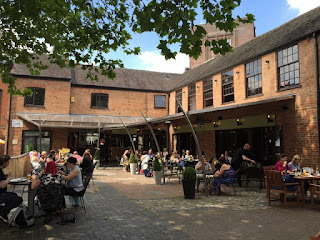 It was a lovely summers day when I visited, so it was great to see the outside tables full upon arriving. I couldn't wait to take a seat! I visited with my mum. We headed straight into the bar area where we were welcomed by a very helpful man. He took our drink order and we chatted about what the menu has to offer and he even gave us some of his recommendations. 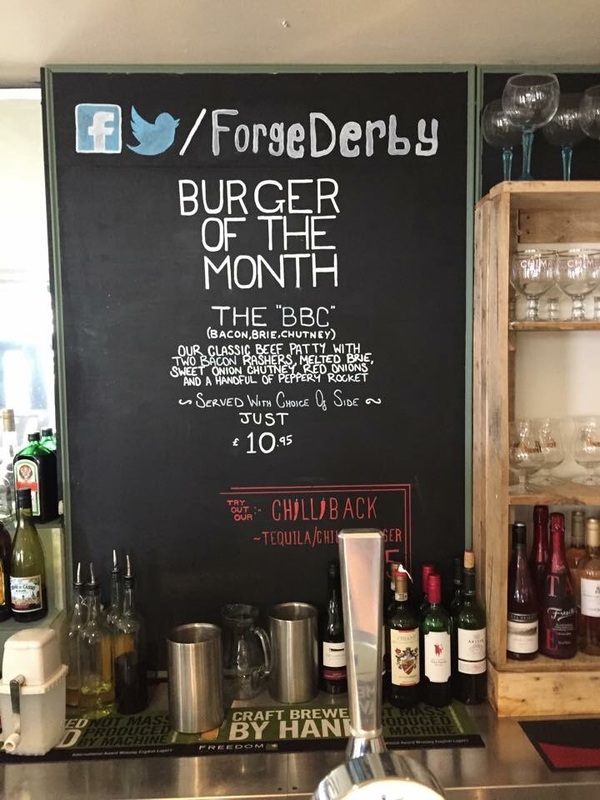 He also pointed out that they offer a 'Burger of the Month' which is displayed behind the bar. 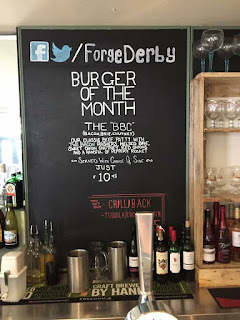 After careful consideration, I opted to try 'something different' as burgers are more and more popular now so I didn't want to have another one really! I went for the 'Goats Cheese Burger' as goats cheese is one of my faves! 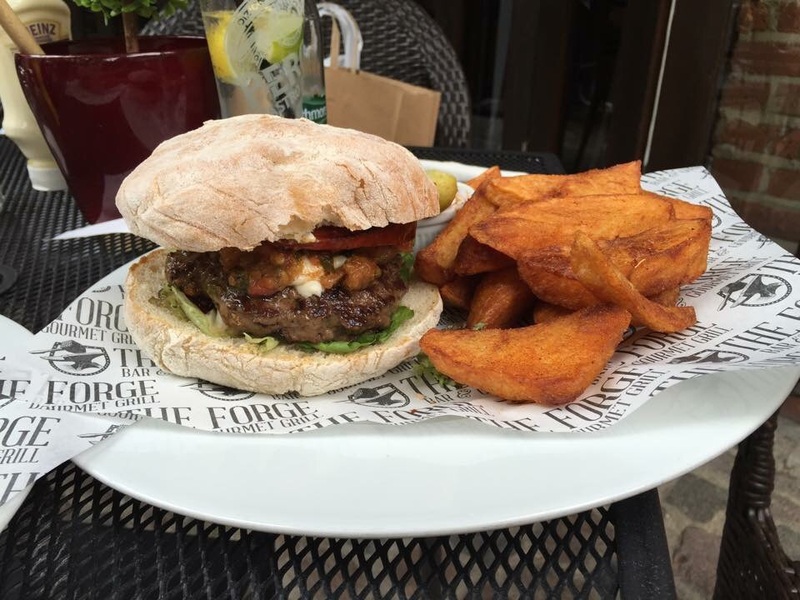 This came served with beef tomato, basil, caramelised red onions and lettuce and chose my side of triple cooked chips. 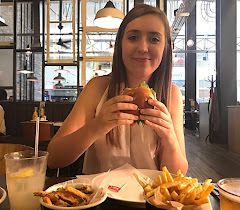 I really enjoyed my meal, especially the chips which were amazing! It was a nice change which I didn't regret. There was plenty of goats cheese, but the only thing I would point out is that the red onion wasn't particularly caramelised which was a shame as the two go perfectly together. 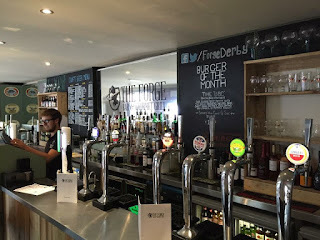 My mum chose the 'Goodfella' Burger which came served with a homemade marinara sauce, melted mozzarella, pepperoni, Parmesan and Italian herbs. However, she chose to have the cajun spiced triple cooked chips. 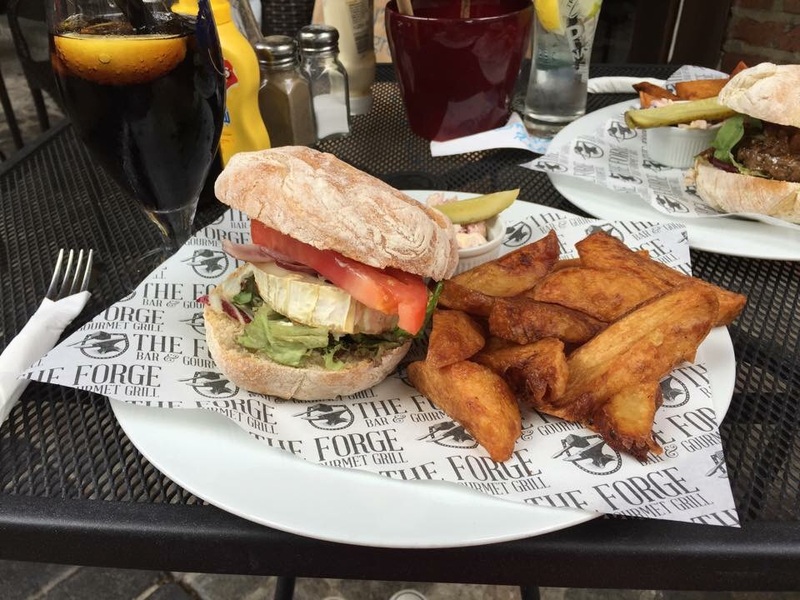 Again, the chips were loved as well as the burger itself (which is sourced locally). The only point my mum had to make was that she would have liked more marinara sauce and mozzarella, but she still enjoyed it a lot! Oh, and all of the burgers are served in either a brioche or ciabatta bun (we both chose ciabatta as you can see). I don't actually know if desserts are offered here, as we were in a rush so literally ate and left. 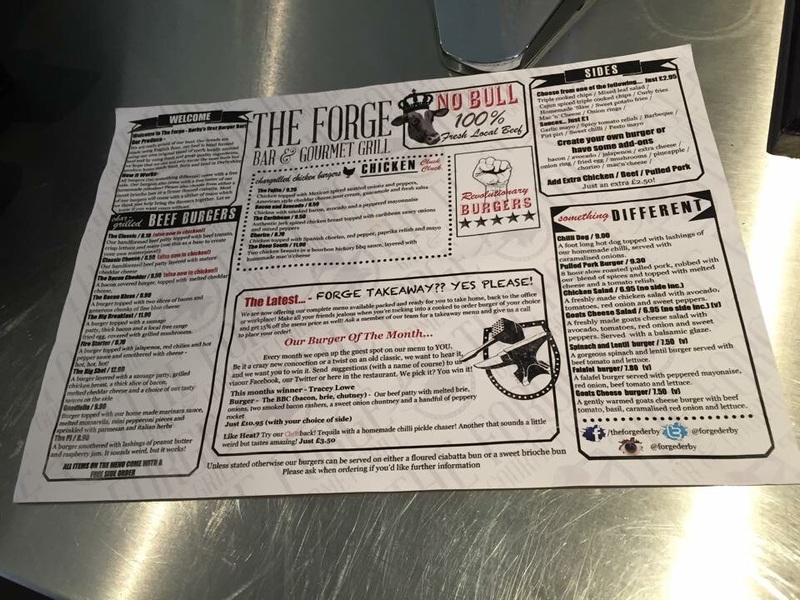 But overall, I really enjoyed my time here at The Forge. I loved how you can sit outside in the courtyard and relax with some good grub. If you're not really a beef fan, it's great that they have plenty of other options too like my goats cheese, pork and chicken. They also advertise a takeaway option too which would be really handy if you worked or lived in the area. As we left, we went inside to pay the bill - all of the food in my opinion is reasonably priced. The staff were all very friendly and said goodbye as we walked away.